ST. GEORGE – One person was sent to jail while another was taken to the hospital following a head-on collision on Bluff Street Tuesday evening that allegedly involved alcohol. 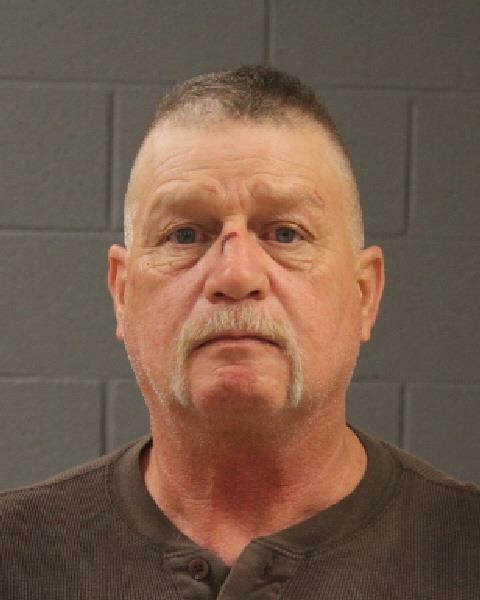 Shortly after 8 p.m., Tuesday, Douglas Darrell Cook, 53, of St. George, was southbound on Bluff Street, having left the scene of an alleged domestic violence incident prior to the arrival of St. George Police officers, according to a probable cause statement. An officer located Cook’s pickup truck eastbound on Sunset Drive and followed it southward on Bluff Street. While approaching 200 S. Bluff, the officer wrote in the statement that Cook appeared to notice he was being followed. At this point he made a sudden turn from the inside lane to the turn lane to get onto 200 South without using a turn signal. Cook was taken into custody at the scene of the crash and placed into the back of a police patrol car. A search of his truck produced a loaded 9mm pistol, as well as a loaded AK-47 rifle. Additional AK-47 magazines were also found in the cab of the truck. A search of Cook’s person yielded suspected drug paraphernalia and a substance believed to be methamphetamine. He also admitted to actions involving the domestic violence incident which involved throwing the victim onto a bed, attempting to choke her, and holding a gun to her head. The woman was able to escape the bedroom and the Police Department was contacted. Cook was booked into the Washington County Purgatory Correctional Facility on multiple felony and misdemeanor charges. Felony charges include: Driving under the influence and causing injury, possession of firearms by a restricted individual, and domestic violence-related offenses of aggravated assault with a weapon and committed the aggravated assault in the presence of a child. Cook also faces misdemeanors and infractions related to the domestic violence incident and vehicle collision. This is one dangerous dude. I hope is off the streets for a long time. He has destroyed the lives of people who know him, and now people who just happened to be going the other way in traffic. If he was any kind of man, he would do the right thing and end it. He is not worthy of trial and punishment. This guy needs to take a dirt nap.